Stress Engineering Services has played a vital role in supporting our rail industry clients with some of their toughest technical challenges. The rail services industry requires innovative engineering solutions in a number of key areas related to testing and troubleshooting. Our renowned experts have decades of active involvement in rail transport testing, rail fatigue testing and rolling stock structural testing. They apply their expertise to rail systems, including streetcars and heavy rail. In addition, they have developed streamlined data acquisition systems capable of handling hundreds of data channels alongside the ability to collect and remotely download data. A Traction Motor Torque Link is engineered to measure axial loads and reject bending, torsion and thermal transients. It measures the impact on the traction motor caused by striking rail section mismatches, but does not change the dynamics of measurements. 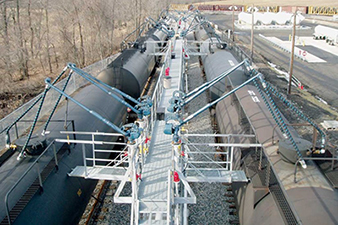 These tests evaluate the failure load or mode for chemical transfer hose to ensure rail safety and performance improvements when under the same conditions as a railcar pulling away from an unloading dock. Our experience involves measuring axle accelerations, traction motor loading (bolts) and GPS speed and position. A DAQ system is packaged to be stand-alone with multiple burst trigger modes capturing high sample rate events. We have the ability to identify test conditions that produce high impact loads on the traction motor. Our experts measure steering displacements and accelerations, which includes axle accelerations, engineer seat accelerations as well as GPS speed and position. The DAQ system is packaged into the floor of the cab and can include multiple burst trigger modes to capture high sample rate events. Data can be collected for one year with a remote download every week. We record engine vibration during switching operations. Tri-axial accelerometers and a light tachometer can be installed on each of the power packs and set up to run as a stand-alone, self-triggered field recorder. Equipped with a long-range Ethernet bridge to check on the status of the test, tests can be conducted from a remote location. Our testing experts evaluate the service life expected for a new design or existing hardware. A torque arm redesign includes improved load path and system response to achieve target life goal, improved fatigue analysis of validation test, improved geometry to achieve life improvement and fatigue analysis using measured service history with an FEA model for an estimated two-week service life. At Stress Engineering Services, we provide independent third party rail testing for design validation or witnessed acceptance testing. Our witnessed acceptance tests installed more than 330 channels of strain, load and displacement and more than five miles of signal cables. We provide measurement-based guidance and recommendations throughout testing to help achieve proper load distribution and test fixture setup. Load case measurements are analyzed within minutes of each load step and presented for review by witnesses. All measurements are also traceable to NIST standards. 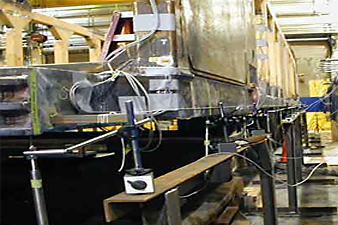 Carbody testing and life evaluation rail testing measured more than 130 rosette locations on the carbody and under the frame in high stress locations. It also measured carbody accelerations, GPS speed and GPS position. A critical-plan fatigue life estimate is made for each rosette location, and locations that are identified as life-limiting locations are recommended to be inspected frequently. The largest damage events were associated with large changes in forward acceleration caused by the stops at each station. In this case, we instrumented a diesel locomotive with more than 200 strain gages, 17 accelerometers and multiple displacement sensors to measure the loading in the locomotive trucks, carbody and engine room for the purposes of performing fatigue life assessment. Instrumentation, testing and life assessment of commuter rail suspension components.